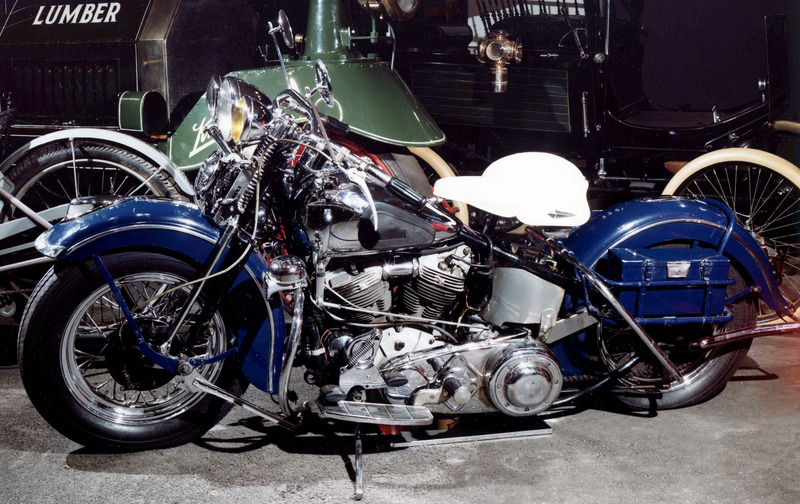 The Smithsonian Institution’s National Museum of American History (NMAH) has a small but choice collection of motorcycles, managed by the Transportation Collection staff in the Division of the History of Technology. Among the highlights are the earliest American motorcycle, a Smithsonian staff member’s daily commuter dating back to 1913, and one of motorcycle daredevil Evel Knievel’s Harley-Davidsons. The collective history of the holdings is rich and colorful, and it continues to grow as new examples of this unique branch of American transportation technology are added to the permanent collection. A motorcycle may be defined as a self-propelled, engine-powered, two-wheeled vehicle. 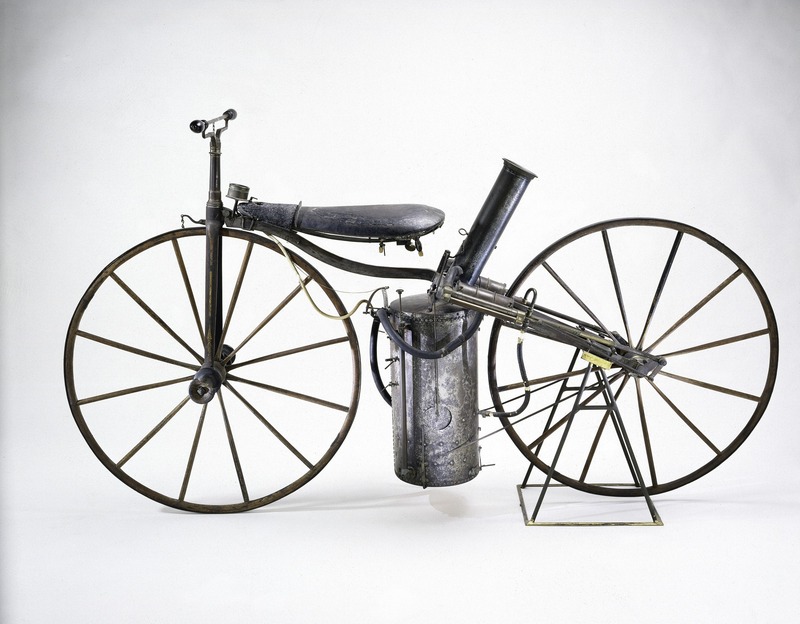 Without question, the jewel in the Smithsonian’s collection is the earliest known example of American motorcycling ingenuity: a steam velocipede built by inventor Sylvester H. Roper of Roxbury, Massachusetts. Although the precise construction date of this vehicle is unknown, it was exhibited and demonstrated at New England fairs and circuses by 1869. Aside from the forged-iron (?) frame and wooden wheels, its most prominent feature is a small, vertical fire-tube boiler suspended on springs between the wheels, just below the rider. The boiler’s water supply was ingeniously incorporated into the rider’s seat, and the water was manually pumped between the two by a hand-operated pump on the forward side of the boiler. The heated steam from the charcoal-fired boiler fired a small oscillating cylinder on either side of the boiler; the throttle was controlled by a rotating handlebar similar in design to the handgrip throttle on modern motorcycles. Twisting the handlebar in the opposite direction applied a friction brake on the front wheel. This vehicle predates Daimler’s 1885 vehicle, often accorded self-propelled primacy, by at least 25 years. Roper was killed on June 1, 1896, while testing a new steam motorcycle at a bicycle track in Cambridge, Massachusetts. Next in time is an 1897 gasoline tricycle built by Louis S. Clarke of Pittsburgh, Pennsylvania. 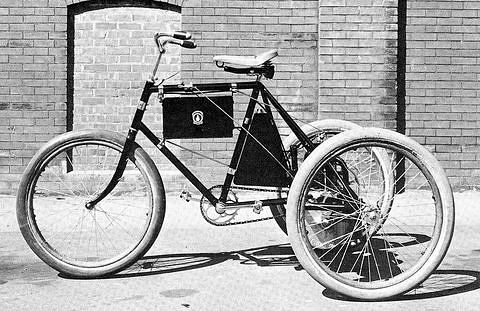 This is a remarkably modern-looking tricycle, converted to self-propulsion by the addition of a single-cylinder gasoline engine mounted just forward of the rear axle. A spark-advance lever served as a throttle control for the single available speed, and another lever operated both the clutch and hand brake. Pedals used for starting the vehicle or moving it when the engine was inoperative were in the usual place and were disengaged by a clutch when the engine was in operation. Pneumatic tires on 26-inch wire-spoke wheels served as the only suspension enhancement. This experimental tricycle led to the first four-wheeled Autocar in 1898, which is at the Henry Ford Museum in Dearborn, Michigan. The pioneering company continues to make long-haul trucks today. 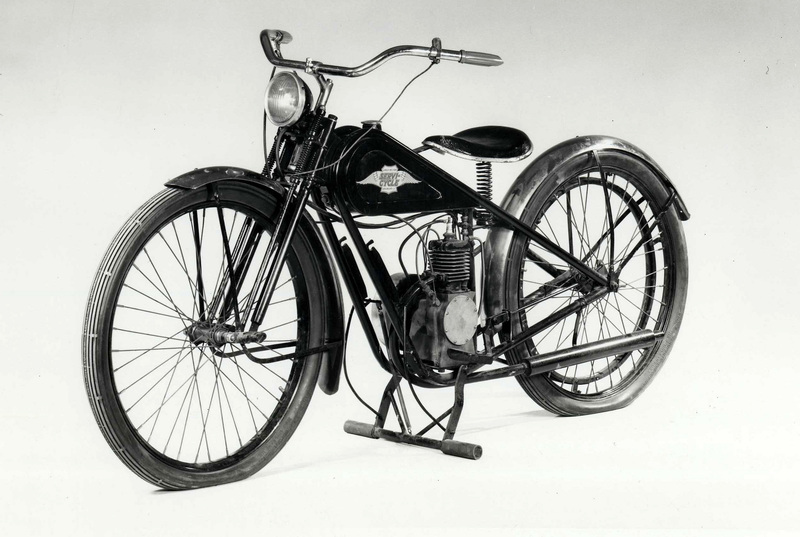 In 1901, bicycle racer Oscar Hedstrom designed a motorcycle for the Hendee Manufacturing Company of Springfield, Massachusetts, which later became the Indian Motocycle Company. The following year the firm produced 143 examples; the NMAH has one. 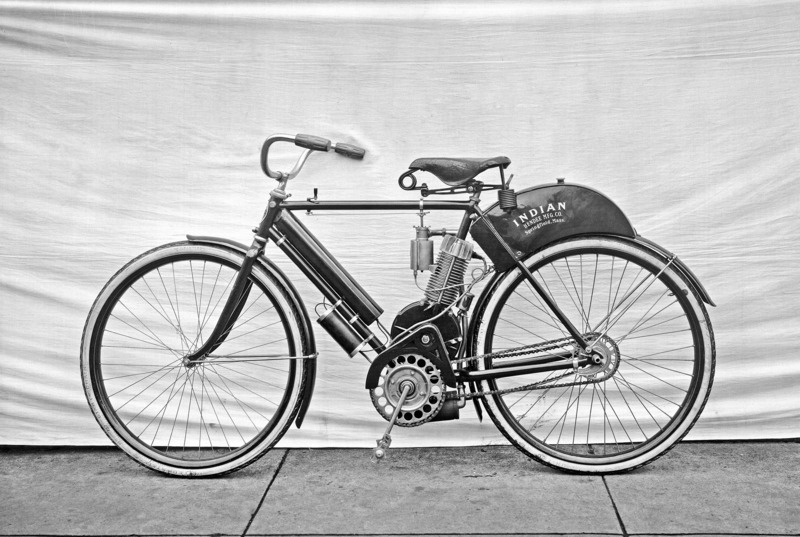 Although it is purpose-built, it closely resembles a modern bicycle, with a small gasoline engine below the seat driving the rear wheel via a dedicated chain. The engine is a 1 3/4-hp, air-cooled 4-stroke; a two-cell tank over the rear fender carried gas and oil for the carburetor and crankcase respectively. Bicycle pedals drive a separate chain to the rear wheel; reversing the pedals applied a coasting brake to the rear wheel. This early Indian weighs 93 lbs. 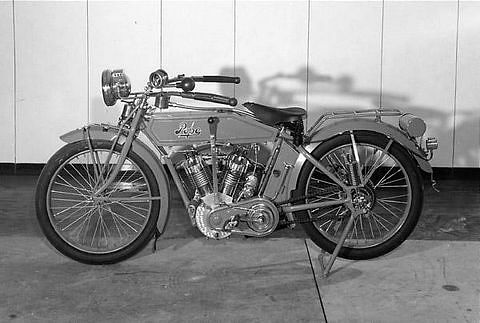 ; the NMAH also has a 1918 Model O, a 1923 example with Princess sidecar, and a red 1941 Four model with Indian’s famous skirted fenders. The only American motorcycle manufacturer still in existence from the early days is the Harley-Davidson Motor Company, which celebrated its centennial in 2003. The NMAH has a number of the firm’s output. The earliest is a 1913 Model 9-B, which has a single-cylinder, 5-hp, 4-stroke air-cooled engine, chain drive, and a coaster brake. When new, this motorcycle cost $235. In 1918 it was purchased secondhand by Smithsonian employee Paul E. Garber, who used it for several years prior to donation to the Smithsonian in 1947. Other Harley-Davidsons held by the NMAH are: a rare 1942 Model 74 custom twin that belonged to Jorge Ubico, president of Guatemala; and a 1972 XR-750 custom used for jumping by daredevil Evel Knievel in the mid-1970s. More recently, the company donated a limited-edition 1993 Electra Glide Ultra Classic touring bike in commemoration of its 90th anniversary. 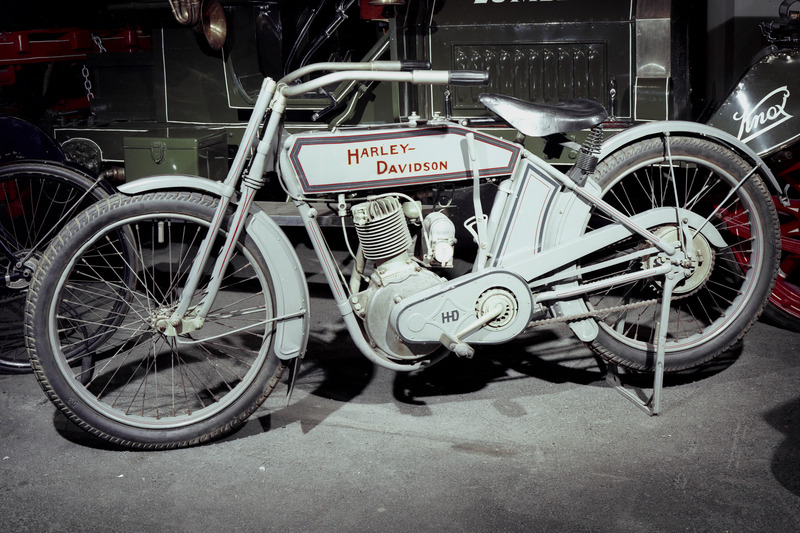 One of Harley-Davidson’s principal competitors in the early part of the 20th century was the Pope Manufacturing Company of Westfield, Massachusetts. Better known for its cars, the firm produced motorcycles from 1911 to 1918. The Museum has a 1913 Model L example, used for only eight years prior to storage and donation to the Smithsonian in 1964. Originally selling for $250 and rated at 7-8 hp, tests have shown that its two-cylinder, air-cooled engine actually produced 15.4 hp at 50 mph and a top speed of 60-65 mph. Another popular bike of the period was the Cleveland, manufactured by the Cleveland Manufacturing Company of Cleveland, Ohio. The Museum has a 1918 example, with a 2 1/2-hp, single-cylinder, 2-stroke air-cooled engine that produced a claimed 35-40 mph through two gears. Originally selling for $175, the 150-lb. motorcycle claimed an astonishing 75 mpg, placing modern internal-combustion transportation in an interesting light. 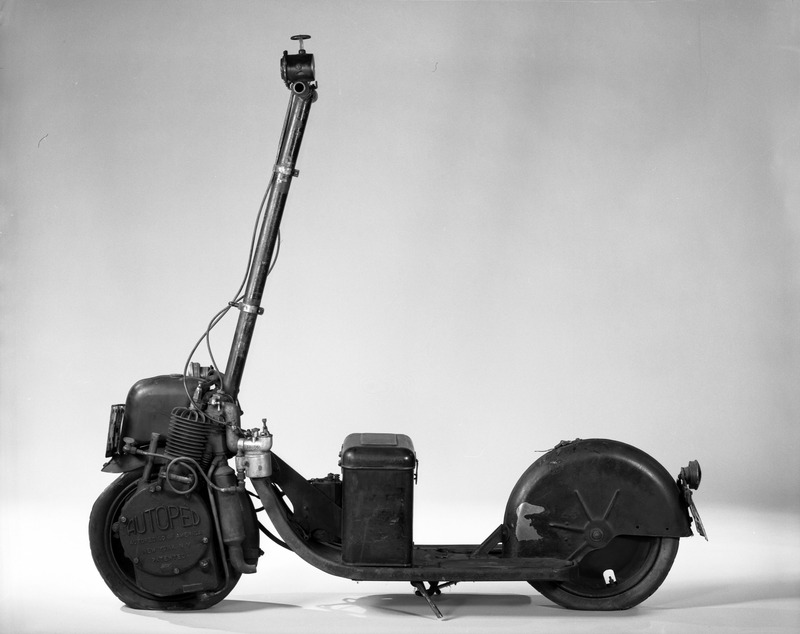 Also from 1918 is the Museum’s Autoped Motor Scooter, made by the Autoped Company of Long Island City, New York. This compact scooter was designed for short distances, in that it had small (15-inch) tires at either end of a short platform on which the driver stood. Once the destination was reached, the steering column, which contained all operating controls, was folded down over the platform and the entire scooter could be stored in a compact space. The little machine was powered by an air-cooled, 4-stroke, 155-cc engine over the front wheel, and it came complete with a headlamp and taillamp, a Klaxon horn, and a toolbox. Developed during wartime and gasoline rationing, the little scooter was quite efficient, but it never achieved widespread distribution. The sit-down type of motor scooter, still popular today, is represented by a 1945 Pacemaker, restored and donated by its original owner in 2000. 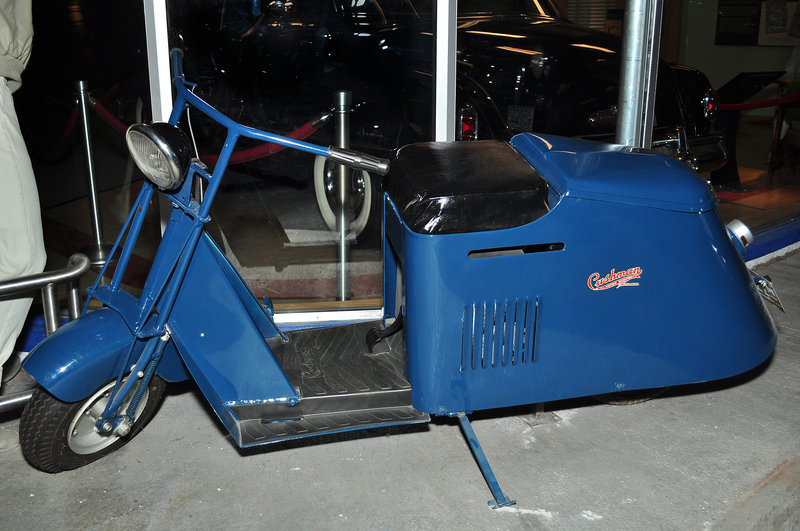 From later in the 20th century is the Museum’s 1935 Simplex Servi-Cycle, made by the Simplex Manufacturing Company of New Orleans, Louisiana. As the name implies, this is an extremely simple motorcycle with a single-cylinder 2-stroke engine producing 2 hp. Lacking even a rudimentary clutch, the engine had to be cut off by means of a kill switch whenever the bike was stopped, and re-started each time motion resumed. It is belt-driven at the rear wheel, which also contains a coaster brake. Wearing a leather helmet, Glenn Curtiss hunches over the handle bars of his experimental motorcycle as he rides at record-breaking speeds, January 24, 1907. Other motorcycle materials at the NMAH include some early racing memorabilia, clothing, helmets, trade literature, photographs, and license plates. Oddly enough, the Smithsonian’s National Air and Space Museum also has a motorcycle in its collections. This is an experimental vehicle owned by aviation and automotive pioneer Glenn L. Curtiss. 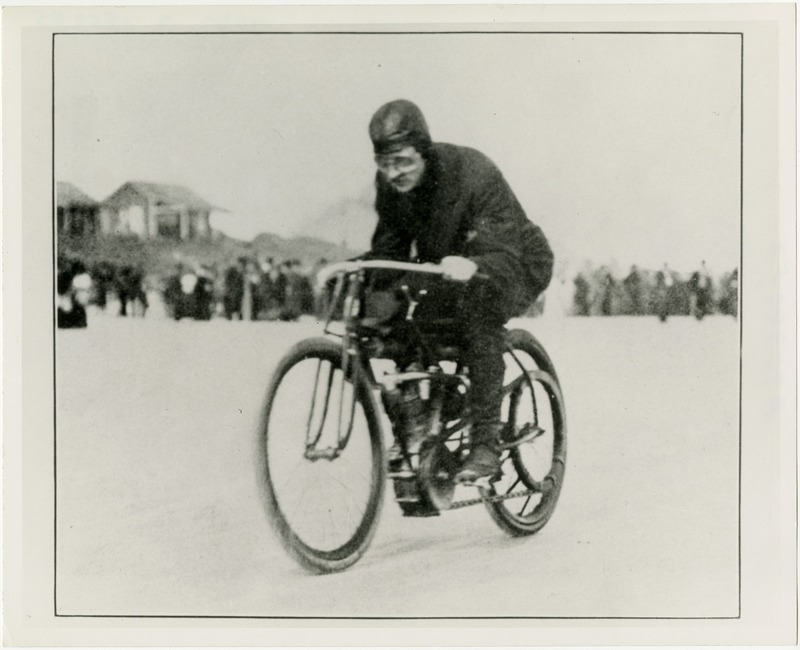 In 1907, Curtiss installed an immense, air-cooled, V-8 aircraft engine producing 40 hp in a hand-built motorcycle and ran it on the beach at Daytona, Florida. The shaft-drive bike ran an unofficial flying mile at a claimed 26.4 seconds, for a calculated speed of 136.3 mph. This motorcycle was so outlandish for the time that it did not fit into any known category; as a consequence, its record speed remained unofficial. 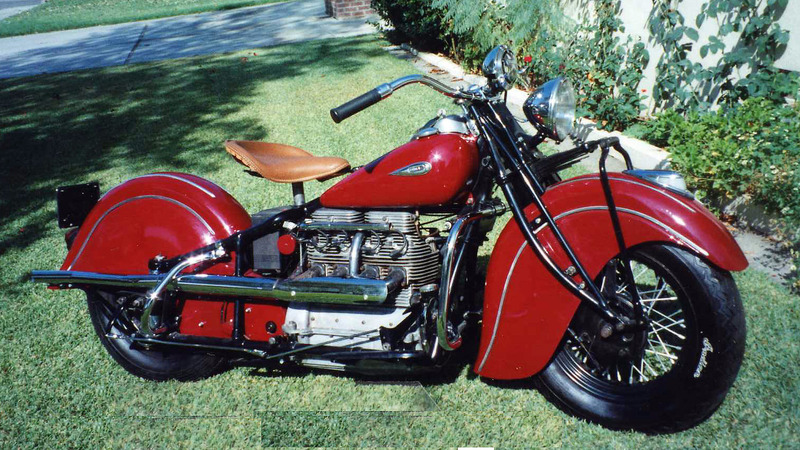 However, this unique bike was preserved and donated to the Smithsonian, where it underwent restoration. More than 280 American motorcycle manufacturers have been identified to date, and additional examples from our past are discovered nearly every year. Of these, only Harley-Davidson remains. However, some of the old marques resonate so strongly in modern culture that there are several current efforts to revive once-famous badges, as Triumph has done so successfully in England. Visitors are often surprised that the Smithsonian has so few examples of the extinct American brands; we hope that in the future more of these marques will be added to our holdings.